"Our clients come back from conferences demanding they need an Automation and a Digital strategy, with no idea what they are", said a senior partner in a Big 4 consultancy yesterday. I have never known a time in the world of business when there is no much hype, confusion and unsettlement. Sadly, we are now living in a world where snippets of soundbites are so intensely shared across the variety media we use (I nearly said "omnichannel") that our industry is completely dominated by hype, as opposed to reality. Let's stop beating around the bush on this one - services providers (in most cases) make nice profit margins on their outsourcing deals. What's happening is that supply is now outsripping demand - there are too many competitors vying for a pool of enterprise clients who want to decrease their external spend. The "demand" is coming from the next layer down of clients (the proverbial "mid market") which just don't have the size and resources to warrant the attention of the top tier providers. 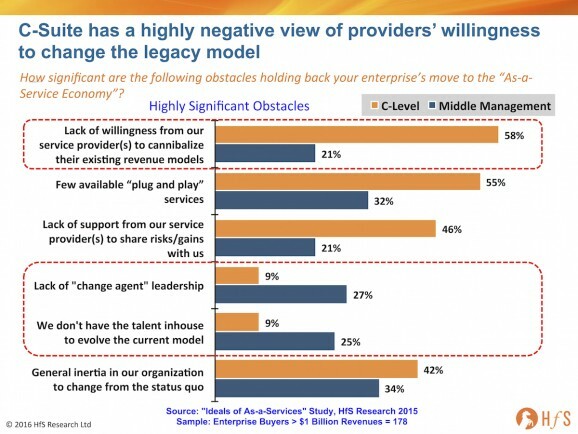 What's more, the top tier of service providers is simply not structured to go after the mid-market - they can't afford to - and are stuck circling the same legacy enterprises like vultures trying to find new ways to squeeze money out of them. Terms like "Digital transformation" are being used as the new levers to encourage gullible C-Suite executives to part with budget in an oddly similar way ERP was used 20 years' ago. The only difference being that, with ERP, you would buy a specific product and find very expensive ways to retrofit it into your enterprise, with "Digital" you just spend wads of cash on consultants to try and help you rethink how you do things... and they proceed to retrofit whatever new tech they can sell you to make those things happen. 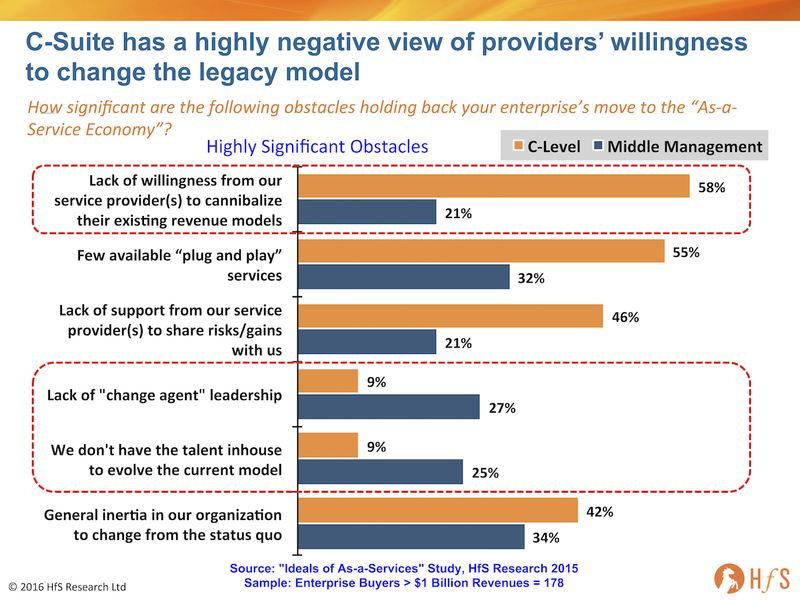 So... when 58% of leadership sees a lack of willingness to cannibalize, it's because they have wizened up to the games of the service providers and realize they can get away with spending less, not more. They want their providers to find smart ways to deliver the same (or more) for less cost. So the onus is moving onto the service providers to decrease the headcount provision for their clients and save them money. However, the middle managers actually running the operations know just how hard that is. You can't just remove staff from engagements because you automated a process, or eliminated some unnecessary sub-steps in that process. In most client scenarios, they just rely on too much unique (and usually legacy) technology to be able to create a true technology underbelly, where Automation and Digital functionality is native, that can help them unearth a lot more value for a lot less effort and cost. In their minds, the cost of the pain and disruption it could cause is just not worth the "desired outcomes". Until those outcomes are proven, the status quo of inertia shall remain. 27% of middle management see the lack of change-agent leadership a significant obstacle, and 25% just admit they don't have the talent. Only 9% of the C-Suite feels this way. The two go hand-in-hand - you need change-agents to incentivize workers to do things differently, and you need workers with the skills and expertise to learn use new systems, technologies, analytics and understand evolving business models. The middle management working the real operations realize this, while their leaders are convinced they can just saw-off their legacy and move to the promised land of As-a-Service. It's a worrying disconnect and something that needs to heal for progress to happen. I've been amazed at the sheer number of Robotic Process Automation pilots and deployments that have sprung up over the past 18 months. Our forthcoming F&A-as-a-Service blueprint report will reveal just how widespread this is. Providers like HP, Accenture, TCS and IBM have been particularly active here. In addition, there is a lot of enthusiasm for Digital initiatives - Genpact's Lean Digital initiative is being talked about by several clients, and I have been highly impressed with Cognizant's approach to "Being Digital" - they really get that this is a business model transformation, not just another app-dev play with Digital sugar-frosting. 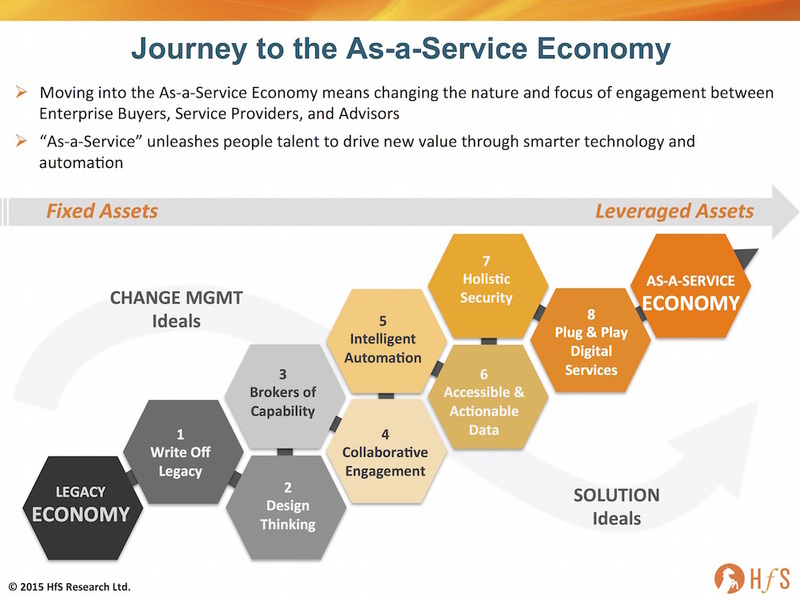 And I like the approach to As-a-Service which Wipro's new CEO, Abid Neemuchwala, is driving. Plus, there is some pretty cool stuff being cooked up from Accenture's operations group with its innovation networks and rethinking how they deliver their services. So let's not get too despondent about the world of confusion in which we currently live - once we really start to see the results of these early phase initiatives, I predict we'll see a lot more "real" investments from enterprises to saw-off their legacy and changing how they run their businesses. This disconnect between leaders and managers will heal over time, just like it did 20 years' ago. Phil very good read and agree with you on the hype although every service provider is working towards realising the next gen automation story. On Robotics do you believe that large biz cases are being met meaning where you have seen proven examples. Kevin Wright's comment are my thoughts exactly. I was nodding as I read the entire post. Totally in agreement with the thoughts. I think you need service providers who will also help client IT team to sell to their business.